The Acumatica Financial Management Suite General Ledger (GL) module is the central repository for your financial information that includes your chart of accounts, financial periods, ledgers, allocations, and more. The GL can be deployed on premise, hosted in a datacenter, or deployed on a Cloud platform so you can control where your data is stored. Access 100% of your general ledger features from anywhere using any popular web-browser. Improve accuracy with advanced security features that limit available accounts and sub-accounts. Reduce time spent entering data with predictive entry and flexible screen layouts. 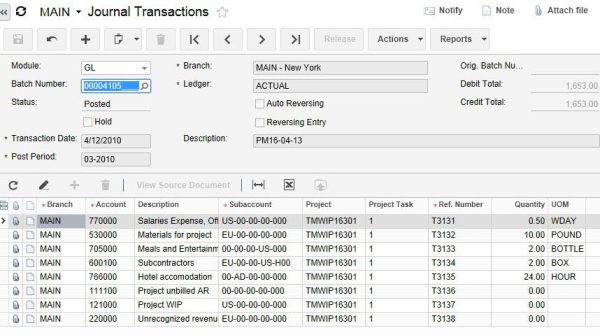 Simplify reporting with integrated query and reporting tools that work with your account structure. Create workflow and approval routes that match existing business processes. Gain a centralized view of your entire business with support for multiple ledgers. Use multiple currencies, translation, consolidation, flexible financial periods and more to work in the way that’s right for your business.